Government allegedly balks at unpopular car bans ahead of Sunday’s local elections. 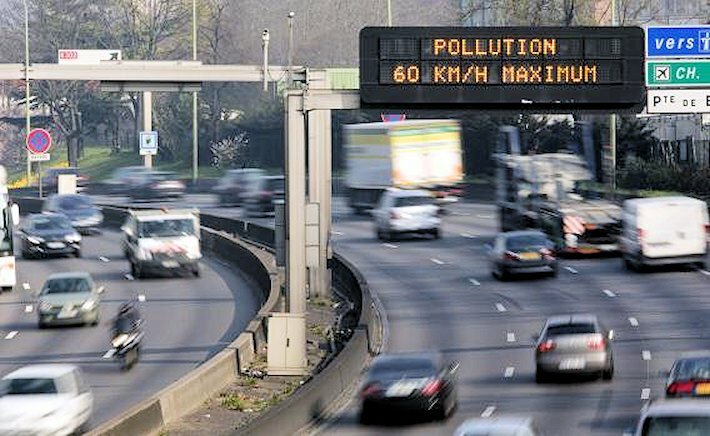 Green Party activists upset over the government’s refusal to allow ‘alternate traffic’ during this week’s pollution spikes will sue the government for ‘endangering the lives of others‘. They will also demonstrate outside the Ministry of Ecology tomorrow (Friday) afternoon. Paris mayor Anne Hidalgo herself expressed some frustration tonight that the second request this week for traffic restrictions had been rejected. Hidalgo requested earlier today that the public transport be made free, transit HGVs be diverted away from the Ile de France capital region and that only cars with registration plates ending in either odd or even numbers be allowed in the city on successive days, so-called ‘alternate traffic’. However, Paris police denied the latter request this evening. Speed limits will be cut by 20kmh on Friday instead. Meanwhile, the Paris deputy mayor Christophe Najdovski – also a Green Party member, and responsible for transport in the city – accused Ecology minister Segolene Royal of ‘looking elsewhere’. Some interpret that to mean Royal is reluctant to impose unpopular car bans ahead of Sunday’s municipal elections. Hidalgo was elected last March, a few days after the city’s previous pollution episode, on a promise to improve air quality. She has since introduced progressive bans on older vehicles and a range of incentives on cleaner transport. Pollution levels in Paris have varied wildly this week, specifically the allegedly carcinogenic fine particles given off by diesel engines, household heating and some industrial processes. For a few hours on Wednesday Paris was reportedly the most polluted major city in the world before levels subsided. However, a new spike is predicted for tomorrow. Paris Air Report says that currently ‘there is no end in sight’.